The prime activity is against the tri and tetra acetylated forms of histone H4. It also reacts with epsilon acetylated lysines. It also reacts with other acetylated proteins: BSA, E2F, PCAF, Importin, GATA1, BRCA2 and Rb. This antibody recognises a wide range of acetylated proteins. Our Abpromise guarantee covers the use of ab193 in the following tested applications. ChIP Use at an assay dependent dilution. Recommended to use 5-10µl for 25µg of chromatin. Chromatin was prepared from Hela cells according to the Abcam X-ChIP protocol. Cells were fixed with formaldehyde for 10min. The ChIP was performed with 25µg of chromatin, 5µl of ab193 (blue), and 20µl of Protein A/G sepharose beads. No antibody was added to the beads control (yellow). The immunoprecipitated DNA was quantified by real time PCR (Taqman approach). Primers and probes are located in the first kb of the transcribed region. Western blot - Anti-Acetylated Proteins antibody - ChIP Grade (ab193)Image courtesy of an Abreview submitted by J Stanley. ab193 used in Western Blotting. Lysate prepared from T47D cells was loaded at 100µg. Cells were pre-treated with either insulin, butyrate, resveratrol or trichostatin A. Primary antibody incubated for 24 hours at a 1/1000 dilution. An HRP-conjugated F(ab)2 secondary antibody was used at a 1/8000 dilution. Left arrows indicate signal increased by treatment with inhibitors of deacetylases. The nuclear protein increased by butyrate and trichostatin A is probably histone H4 based on its size. One unidentified protein of approximately 65kDa is increased by the treatments in cytoplasm. Publishing research using ab193? Please let us know so that we can cite the reference in this datasheet. 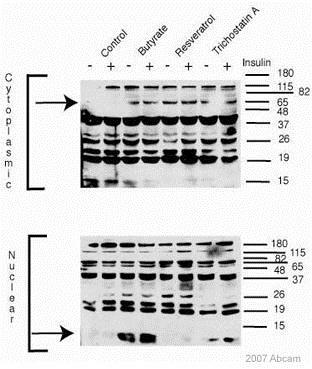 Nous avons un anticorps "anti-Acetylated Proteins" testé en IP et Western Blot, le ab193. Le lien vers la fiche technique est https://www.abcam.com/ab193. Thank you for your kind response. As I have explained in my previous e-mail any human lysate will probably have high levels of histone acetylation. However, it may be useful to treat the cells to maximize the level of acetylation. We have a very informative landing page for Epigenetics & Nuclear studies, please take a look at it: https://www.abcam.com/index.html?pageconfig=resource&rid=13907 Nuclear extraction kits: - ab113474 - ab113477 - ab117152 Histon extraction kit: - ab113476 DISCOUNT CODE: 100%ABR-XXXXXX Expiration date: XXXXXXX I am very pleased to hear you would like to accept our offer and test ab193 in brine shrimp (Artemia). This code will give you 1 free PRIMARY ANTIBODY before the expiration date. To redeem this offer, please submit an Abreview for brine shrimp (Artemia) and include this code in the “Additional Comments” section so we know the Abreview is for this promotion. For more information on how to submit an Abreview, please visit the site: www.abcam.com/Abreviews. Remember, we publish both positive and negative Abreviews on our datasheets so please submit the results of your tests. The code will be active once the Abreview has been submitted and can be redeemed in one of the following ways: 1) Call to place your order and mention the code to our customer service department; 2) Include the code in your fax order; 3) Place your order on the web and enter the promotional code. Any feedback that you can provide will be greatly appreciated, whether positive or negative. If you have any further questions, please do not hesitate to contact us. We look forward to receiving your Abreview and wish you luck with your research. The terms and conditions applicable to this offer can be found here: www.abcam.com/collaborationdiscount. Thank you for your response. First of all, I can offer a discount code for testing this antibody in untested species. Please take a look at this initiative and the conditions and let me know if you wish to proceed: www.abcam.com/collaborationdiscount. I have discussed your enquiry with some expert and would like to pass the following information to you. Any human lysate will probably have high levels of histone acetylation so you could try this first. You need to treat the cells as described below to maximise the level of acetylation. 1. Harvest cells and wash twice with ice-cold PBS. PBS can be supplemented with 5mM Sodium Butyrate to retain levels of histone acetylation. 2. Resuspend cells in Triton Extraction Buffer (TEB: PBS containing 0.5% Triton X 100 (v/v), 2mM phenylmethylsulfonyl fluoride (PMSF), 0.02% (w/v) NaN3) at a cell density of 107 cells per ml. 3. Lyse cells on ice for 10 minutes with gentle stirring. 4. Centrifuge at 2000rpm for 10 minutes at 4°C. Remove and discard the supernatant. 5. Wash the cells in half the volume of TEB and centrifuge at before. 6. Resuspend the pellet in 0.2N HCl at a cell density of 4x107cells per ml. 7. Acid extract the histones over night at 4°C. 8. Centrifuge samples at 2000rpm for 10 minutes at 4°C. 9. Removed the supernatant and determine protein content using the Bradford assay. 10. Store aliquots at -20°C. I would suggest you extract the histones, otherwise the blot could be really dirty as all acetylated proteins will be detected. I hope this helps and if I can assist further, please do not hesitate to contact me. Thank you for your enquiry regarding ab193. I can confirm that this antibody detects any acetylated proteins and it should work in many mammalian species. Unfortunately, it has not been tested specifically in crustaceans at all. Theoretically, as long as the samples have acetylated proteins at detectable levels, ab193 should be fine. Are you interested in any specific proteins which are acetylated? Currently we have an antibody which recognizes acetylated alpha tubulin and it works in Sea Urchin (Echinodermata) so it may also work in Crustacea. Positive control can be acetylated human histone H4 or cells which have been stimulated for acetylation ie. insulin, butyrate, trichostatin A. Secondary antibody can be goat/donkey/sheep anti-rabbit IgG HRP. You may wish to use our advanced search engine specifically designed for secondary: https://www.abcam.com/index.html?pageconfig=productmap&cl=918 I hope this helps and if I can assist further, please do not hesitate to contact me. Thank you for your enquiry. I can confirm that ab193 is raised against hyperacetylated histone H4 and indeed recognizes AcH4 very well. It also exhibits some activity against epsilon-acetyl lysine in some other proteins, such as Gata1 (see Hung et al. 1999, Mol Cell Biol v19, p3496). But not all proteins containing acetylated lysine residues are recognized, so it is probably dependent on the context of the acetylation in some way. Unfortunately, no rule has so far emerged. Regarding palmitylated proteins, I am sorry to confirm we do not have antibodies that would recognize this. I am sorry there are no products to suggest for your requirements on this occasion. I hope this will be helpful to you. Should you have any further questions, please do not hesitate to contact us. It states under specificity that "The prime activity is against the tri and tetra acetylated forms of histone H4. It also reacts with epsilon acetylated lysines." Exactly which lysines are acetylated? Thank you for your enquiry. Rabbit polyclonal to Acetylated Proteins - ChIP Grade (ab193) was raised using an immunogen of chemically acetylated human histone H4. It does not carry specificity for a particular acetyl-lysine residue. The reactivity for tri- and tetra-acetylated histone H4 was shown through AUT gel electrophoresis. Whilst there is a accepted order of acetylation on histone H4 (K16 > K8/K12 > K5) this antibody does not have particular specificity for the acetyl lysine it binds to. Furthermore it demonstrates reactivity against non-histone proteins that are acetylated such as BSA, E2F, PCAF, Importin, GATA1, BRCA2 and Rb. I hope this information helps, please do not hesitate to contact us if you need any more advice or information. What lysine residues does this antibody recognize? Thank you for your enquiry. The immunogen was chemically acetylated histone H4 (H4 treated with acetic anhydride) and it works well in enriching chromatin (ChIPs) in almost all acetylated forms of H4 (though we have not tried it specifically with site-specifically modified H4s). It also contains some activity against epsilon acetyl lysine in general and a few people have used it to recognize acetylated forms of other nuclear proteins. But there is no certainty that it will recognize all acetylated proteins, e.g. I do not know if it will recognize acetylated p53. I hope this information helps, please do not hesitate to contact us if you need any more advice or information.